The first raindrop hits the ground. Then a few more tap on the concrete alley outside my bedroom window. Suddenly I hear thousands, probably millions more raindrops land upon the thirsty ground. How many raindrops does an average storm produce in one square mile? Do raindrops compete with each other to see who will land on the ground first? Laying in bed, listening to the rain, I was composing tweets in my head with these questions. 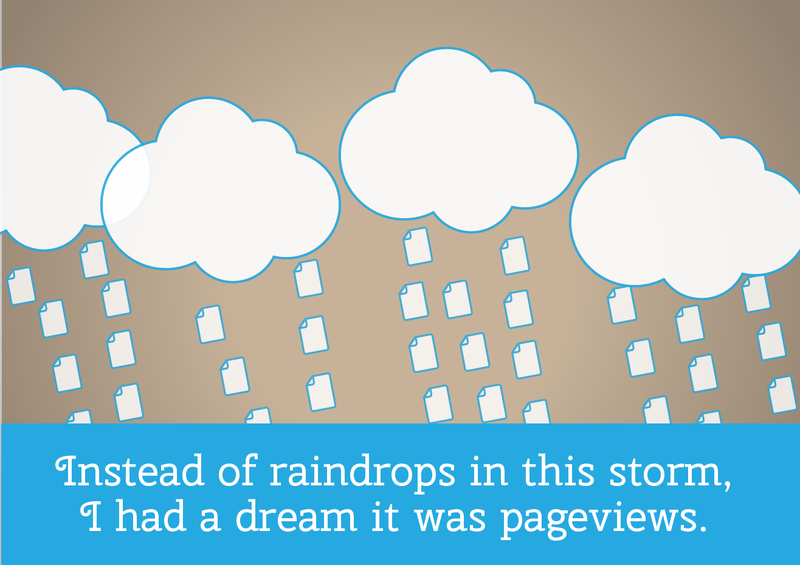 Instead of the word “raindrops,” my brain used the word “pageviews.” Funny to think I was dreaming about a storm where instead of raindrops, pageviews were falling from the sky. Each pageview one person looking at a page on your website. The storm of pageviews starts off small and light. Maybe just about ten raindrops. But then the floodgates open and you have million of pageviews. Now that is a nice day dream.